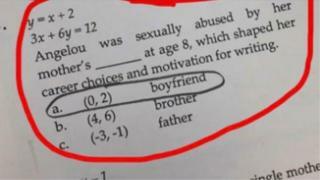 A US secondary school has apologised after setting a maths questions that asked students about a girl being sexually abused by family members. It asked what was her other means of support, including another formula for the options, bookie, drug dealer and nightclub dancer. The questions were based on the life of the famed American poet Maya Angelou, but many parents complained the subject matter was not appropriate for young teenagers or a maths equation. Pennridge School District said it had received a number of complaints about homework "which contained adult content without a proper context". "The homework worksheet in question was downloaded from a website that allows teachers around the world to share educational resources. "It is not part of our approve curriculum." But a Twitter user, @PennridgeReform, who tweeted an image of the assignment, commented: "How can we trust the teacher with the kids' education when these questions are permitted?"